Oh my goodness, it happened again! Blame it on Uber map while picking up passenger? Well, I did raise my issue, but effectively from some days since August, Uber has stopped reimburse whatever cost driver incurred while on the way to pick up passenger. I should have read the signboard before I entered the gantry. At least, this time round the cost was only $1.07, as compared to the previous one. By following the map, I arrived at this place call SLF (Thomson), it was really a super short cut as shown in the map, probably take about 3-5 mins to reach the passenger as compared to if I were to deroute and avoid the gantry. After I collected and drive my LCR car (Toyota Sienta Petrol) for a few days, I received an email from Uber. The title of the email I received is "You're invited to UberClub!" Initially, I thought that Uberclub comes with certain facilities like gym, swimming pool, jackpot rooms etc. Because it reminds me of other companies' member club for most of the employees working under a big organisation. However, after I checked my email, I saw that Uber now came out with something called the "loyalty programme". So "what's in it for me?" you may asked. 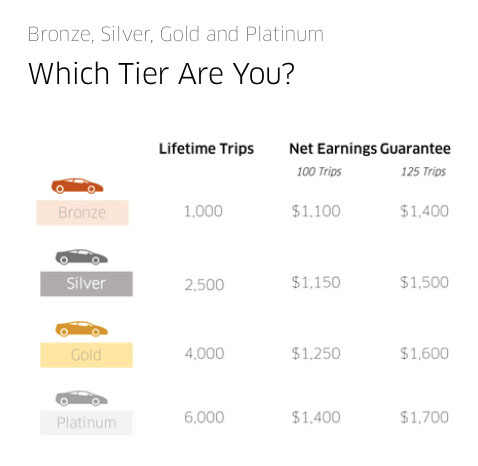 This means that the more you drive with Uber, as you hit different tiers for your lifetime trips, the more net earnings guarantee you can get. Which is good in a certain sense, which means now you can focus more on hitting weekly trips rather than just focus to drive during surge period.